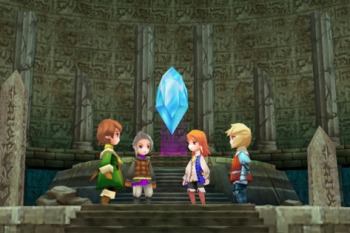 Final Fantasy III is on the App Store and is more expensive than an HD movie, but Square Enix has slashed prices on its other games to celebrate the launch. Square Enix has been bringing some pretty excellent titles to iOS devices lately, both revamps (like Secret of Mana) and quality original games (Crystal Defenders, Chaos Rings, and Song Summoner have all garnered some particularly good reviews). Now, however, the company has announced what is quite possibly its biggest game for the system: Final Fantasy III. While the game is the most expensive iOS game Square-Enix has put out ($15.99), the publisher is slashing prices elsewhere in the App Store. This is the original Final Fantasy III from Japan that was released in 1990, not the 1994 game that was released in North America on the SNES. The game has been hailed as being what innovated the entire series, as it featured a job system that let characters change classes at any time and also included the ability to summon iconic creatures like Shiva and Bahamut. This is the full 3D remake of Final Fantasy III that was released back in 2006. Based on the screenshots in the App Store, the game certainly looks visually stunning, and apparently the graphics have been touched up even more for the iPhone's Retina display. Meanwhile, Square Enix has reduced a number of other iOS titles by over 50% until March 31st. Secret of Mana is now $3.99, Song Summoner is $4.99, Chaos Rings is $5.99, Hills and Rivers Remain is $1.99, and Sliding Heroes is free.